touring the CINCOfacility in Highland Park and meeting their amazing Executive Director, Martha Rivera. If you’ve never heard of CINCO please visit their website here and check out the amazing work their doing. This isn’t exactly Hollywood, but there are a lot of things we could learn from this community program that could be implemented in Hollywood. The urban art above has nothing to do with CINCO, but it was in the parking lot next to the building and I just loved it. We’re considering something like this on our ugly freeway wall. What do you think? Afterwards we had some amazing Salvadorian food down the road. A collage of tidy older homes, hip coffee shops, ramshackle clapboard houses, and parks line the busy streets of the Boise neighborhood in Portland, Oregon. Boise is home to wise elders who have been rooted in this colorful historic neighborhood for decades. It is stomping ground for an assortment of gangs who posture for power and keep police on regular patrol. It is also prime real estate for gentrification. Established as a Scandinavian and Polish neighborhood in the late 19th century, Boise has over the years become one of the more ethnically diverse neighborhoods in inner city Portland. Apricot Anderson Irving is the daughter of missionaries to Haiti. Her third-culture upbringing compelled her to ensure her two young boys would feel at home in a diverse community. Boise met her criteria. In 2008, when Apricot and her husband, David, moved the family from London to the neighborhood, Boise’s urban renewal was already in full swing. My friend, Kelly Bean, wrote this piece. It is an important reminder to me about what makes a church like Hollywood a different kind of place, built on stories of our community. To the degree that we’ve gotten away from this, as a congregation, we have become weaker and more fragmented. Tomorrow is Ash Wednesday, the first day of the season of Lent, which begins the long 40-day journey to Easter (not counting Sabbaths). I barely remember celebrating Easter growing up. I never heard of Lent until I was much older. Today I can’t imagine the experience of Easter without the long, arduous journey of repentance and confession the church calls Lent. And for the first time I am officiating two Ash Wednesday services in my church in Hollywood. This is new for us. Some will say that this is not biblical (I’m not even going to get into that here). Others will say that this is foreign to our tradition. To that I would say that the actual practice of Ash Wednesday and Lent is, indeed, foreign to our tradition, but the Wesleyan commitment to soul-searching, confession of sin and sanctification is very much a part of my Adventist upbringing and theological heritage. I believe the practice of Lent locates this tradition in a concrete practice and helps me (and I hope, my community) to redeem the time and make Easter about something besides Easter eggs and bunnies. Beware of practicing your piety before others in order to be seen by them; for then you have no reward from your Father in heaven….And whenever you pray, do not be like the hypocrites; for they love to stand and pray in the synagogues and at the street corners, so that they may be seen by others. Truly I tell you, they have received their reward. But whenever you pray, go into your room and shut the door and pray to your Father who is in secret; and your Father who sees in secret will reward you. The teaching is not that we should hide our good deeds. That might be appropriate in some cases, but it is not Jesus’ point. There is nothing inherently wrong with them being known…. [The question is] not are we seen doing a good deed, but are we doing a good deed in order to be seen. Second, our intent in determined by what we want and expect from our action. When we do good deeds to be seen by human beings, that is because what we are looking for is something that comes from human beings. God responds to our expectations accordingly. When we want human approval and esteem, and do what we do for the sake of it, God courteously stands aside because, by our wish, it does not concern him (The Divine Conspiracy, 189-190). The imposition of ashes on Ash Wednesday is nothing if not bold. … a dark and undeniable slash across your forehead, a bold proclamation of death and resurrection all at once. You forget that it is on your forehead and you walk out of church, out into the world, a living reminder that Christ died for us… The cross on our foreheads is meant to be a dramatic reminder to ourselves – and it is that. When Milind looks at me and says, “Remember that you are dust and to dust you shall return,” I know what God did for me. He not only created me, he then poured out his grace upon me in the blood of his Son. Me, a bunch of dust! But the cross also stimulates other people’s questions. It provides an unmistakable opportunity – even obligation – to witness. Tomorrow, the brave few will wear ashes on their foreheads for some part of the day as a reminder to themselves of their mortality and as a sign of their sincere penitence. They will also, at the same time, bear a bold witness to all that they meet, that they are marked by God. I’ve been invited by a couple of the faculty at the School of Religion at Loma Linda University to participate in a conversation being taped today for Loma Linda Broadcasting Network on the topic of Human Trafficking. Dr. Julius Nam is the co-host of this regular program called “Intersections” (what a nice name for the program) and Dr. Siroj Sorajjakool is an expert on this topic especially as it relates to his native Thailand. 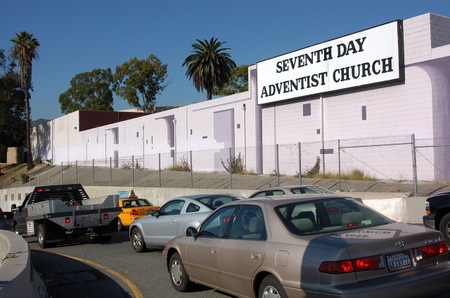 Our congregation has been getting our feet wet by cultivating awareness about Human Trafficking in our community of Hollywood and around Los Angeles, as well as planning a study tour to Thailand in the near future. But I’m certainly no expert. I really have no idea what to expect today, but we’ll just see what happens I guess. I’ll let you all know when it will be aired and/or available online so you can see for yourselves. Our church got some great news this week. In mid-October we submitted a 32-page grant application to the City of Los Angeles Board of Public Works. Every year the city gives out approximately $800,000 in 90 or so grants for community beautification projects being spearheaded by neighborhood groups, businesses and others (click here to learn more about the Community Beautification Grant). Our project, called Crossroads @ HOLLYWOOD, is a public art mural that will go on the west facing wall of our property that overlooks the freeway. You can see in the picture below that the wall is currently an eyesore and a magnet for graffiti. The idea for this project came from one of my church members, has been discussed around the church for more than a year and grew to this point in the context of one of our Missional Action Teams. This particular MAT was charged with the challenge of understanding and designing an experiment around the question, “How can we imagine ourselves as God’s missionary people sent to be the presence of Christ amidst the people in our neighborhood?” So, yes, this mural will beautify our wall and be a deterrent to graffiti. But it’s real purpose is to foster conversations in the community about who we are, what we value and who we are hoping to become, as a community. 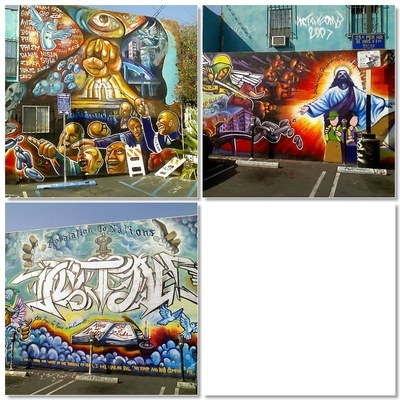 Because we are being funded, in part, by the City of Los Angeles, the mural cannot be explicity religious. This is a plus for us and really challenges our MAT to consider what it would mean to enter our community as listeners, looking for signs of God’s kingdom and then using our wall as a “canvas” to paint the hope that our community has for its future and its role in the life of the people who live and work here. Rather than using our wall as a “billboard” to market our brand of religion and blare our message at people as they go buy, our dream is for the art that will grace this wall to be a genuinely public creation and a reflection of our shared life. In order to facilitate this, the team will be running a series of design input workshops with a special focus on getting input and involvement from our Community Partners as well as the wider community. The artist – ManOne – will then take all that input and design a mural which will eventually be approved by the Department of Cultural Affairs and be painted on our wall by May of this year! To see a rendering of how the wall will look when it is complete, please visit the About page on the Crossroads @ HOLLYWOOD website. About two weeks ago I wrote a piece on the doctrine of the church. In that piece I argued that the church is an alternative community – a distinct polis – called together (ekklesia) by Christ and sent to be witnesses to the reign of God. In thinking about the doctrine of baptism – and in an attempt to turn our attention to the practice of baptism and the question of what baptism is for – I’d like to expand, briefly, on this notion of the church as a new society or a new polis. In these series of essays on the 28 Fundamental Beliefs we are being asked to examine how our beliefs translate into action. That is, how does the official statement of what we believe lead us toward an understanding of Christian habits and practices? So, the crucial question is not what one believes about the church or about baptism or any other doctrine, but how one practices those beliefs and how those practices shape our life and witness in the world. But you are a chosen race, a royal priesthood, a holy nation, God’s own people, in order that you may proclaim the mighty acts of him who called you out of darkness into his marvelous light. Once you were not a people, but now you are God’s people; once you had not received mercy, but now you have received mercy. Beloved, I urge you as aliens and exiles to abstain from the desires of the flesh that wage war against the soul. Conduct yourselves honorably among the Gentiles, so that, though they malign you as evildoers, they may see your honorable deeds and glorify God when he comes to judge (1 Peter 2:9-12, NRSV). Notice the repeated emphasis on being “a people” and the idea of aliens and exiles (or strangers). This is Peter’s theology of the church. Baptism, then, is basically inauguration into this new community. In my Bible studies to prepare people for baptism we use the metaphor of naturalization. “For it is by grace you have been saved, through faith—and this not from yourselves, it is the gift of God—not by works, so that no one can boast”(Ephesians 2:8-9). Then, just three verses later, Paul sets this salvation in explicitly political terms. “Remember that at that time you were separate from Christ, excluded from citizenship in Israel and foreigners to the covenants of the promise, without hope and without God in the world” (vs. 12). But, because of what Christ has done to break down the wall of separation through his death on the cross, he declares, “you are no longer foreigners and aliens, but fellow citizens with God’s people and members of God’s household” (vs. 19). Here Paul mixes two familiar metaphors for the ekklesia – the polis and the family. He makes a simple argument: before you were aliens and outsiders, now you are included. In the political metaphor the means of going from being an alien to being a citizen is immigration and naturalization. In the familial metaphor, the means is adoption. These are two different ways of talking about baptism. Either way, it is a rite of passage into a new social reality that we call the church. To stay with the political metaphor (because it is more provocative and therefore more helpful, I feel, at getting at the heart of the issue), what exactly does naturalization mean? This, it seems to me, is a perfect description of baptism. 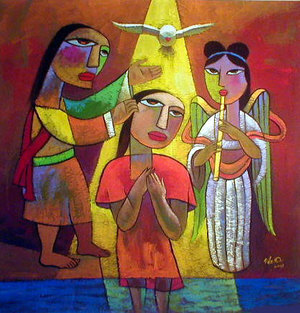 Baptism is an act (a rite or a sacrament, we would say) whereby a person leaves behind her citizenship in “this world” and becomes a citizen of “the kingdom of God.” Remember that “kingdom” is also explicitly political language. To follow Wikipedia’s definition a little further, baptism is associated with migrants or aliens who have immigrated and resided there as aliens and who have chosen to become citizens of that country after meeting specific requirements. This is the reasoning that enables Paul to say, “But our citizenship is in heaven. And we eagerly await a Savior from there, the Lord Jesus Christ” (Philippians 3:20). Immigration refers to the physical and spatial act of moving from one country to another and naturalization refers more to the process of transference of ones loyalties and commitments to a different “lord,” whether that lord is a Constitution or a way of life or a King or Queen. Additionally, citizens inevitably go through a process of resocialization in the new location. This I would argue is the process of discipleship. So now, following baptism, rather than being aliens and outsiders from the household, or polis, of Israel, we are now citizens. And, instead of being citizens of this world, we are now aliens and exiles, as Peter put it in our earlier text. This is a reversal of loyalties. But there is a both/and nature to this relationship. We are not completely immigrants to the kingdom of God. We are still expatriates in this world. We are ambassadors, to use another Pauline metaphor, representing the reign of the King, but stationed in outposts in the kingdom of this world, for the purpose of doing the King’s work of redeeming the world that the King loves. This political act of baptism has real risks associated with it. The kingdom we seek to leave behind is not content to see its citizens simply walk away. To transfer one’s loyalties to a new King is a subversive act, which has led Rodney Clapp to say that Baptism is an act of civil disobedience. “…when the church takes itself seriously as an alternative culture, baptism is politically charged. When we recognize that ‘the people of God do not go to church; they are the church,’ baptism can quickly, easily and accurately be seen as act of civil disobedience” (Rodney Clapp, A Peculiar People, 102). And, as N.T. Wright is fond of saying, to declare that Jesus is Lord is to simultaneous declare that Caesar is not. None of this takes away from the understanding of baptism as a person’s public confession of “faith in the death and resurrection of Jesus Christ” as the Fundamental Belief states in the open sentence. Indeed, it is this world-changing act of Christ’s death and resurrection that has opened the door of immigration and naturalization. And if the reader today is an immigrant from a totalitarian state to a free and democratic state, he or she knows that this is, indeed, good news! Baptism has real social power, similar to the power of standing with other immigrants, raising your right hand and pledging to be loyal to the United States of America. To wake up the next day and realize that you are a naturalized citizen of a new land is amazing good news. For the past couple of days I’ve been in Washington, D.C. at the inaugural gathering of the CANA Initiative, representing Level Ground, among other things. We met the first night in the home of the Dean of the Cathedral, Gary Hall, just across the street. It was an informal, festive welcome to the three-day long gathering. The next day—our only full day—we spent on the seventh floor of the beautiful Washington National Cathedral. The day started with a variety of individuals talking about why they are initiators of CANA, which, in addition to being a reference to the first miracle of Jesus as recorded in the gospel of John, is also an acronym. The goal, as I understanding it (and here is a ton of stuff written about this on the website) is to bring together leaders in faith-based organizations to network for collective action. In the room were representatives from the Episcopal Diocese of Washington DC, including the Bishop herself, Mariann Budde, leaders of various faith-based organizations including, Bread for the World, Odyssey Networks, Sojourners, Faith in Public Life, Faithful America, and The Beatitudes Society; Center for American Progress, historians (Diana Butler Bass); theologians (Philip Clayton), community organizers (Alexia Salvatierra) and ordinary clergy, activists and organizers like me. The balance of our time together was spent in group exercises in which we learned what each of us was already doing and then dreaming (or, idea jamming) about what we might accomplish together. I arrived skeptical, but my skepticism soon disipated when I realized that this was going to be about learning from one another about how to act together for important common causes. One question I had going into this week was, is this Emergent Village 2.0, or re-Emergent? I think I can now safely say, no. The conversation has broadened. This is no longer a conversation just about post-Evangelical/post-liberal theology or western philosophy. It appears that we are moving toward genuine praxis. And, we are more aware of our shortcomings. One particular moment brought me to these conclusion. Brian McLaren took the microphone for a few minutes and said what many of us were thinking and feeling: once again, we were mostly a gathering of white people. There were definitely more women than I’ve seen at some of these things, but not nearly the broad ethnic and racial representation that I have experienced at PICO National Network gatherings, for example. Brian said two things that I remember clearly. First, he urged the white people in the room to admit that they still don’t get it. He cautioned us that this is easy to assent to and much harder to live by. No matter how much we’ve read, how many experiences we’ve had, and how enlightened we are on the subject of race, no white person understands what the challenges really are for people of color in America. Secondly, he plead with the approximately five blacks and two or three Latino leaders in the room to be courageous, speak up, and tell us the truth. He acknowledged what I always feel in moments like this: oppressed people have to not only deal with oppression but they are also tasked with teaching the rest of us how we’re the oppressor. Then they have to listen to us explain how we totally get it and that we’re the exception. This is unfair but still important work. Until white folks confess what they don’t know and can never fully know we will continue to create the same dominantly white, male networks which they wring their hands that we don’t have more people of color in the room. The conclusion is simple: we still don’t have who we need around the circle. We cannot accomplished the things we want to accomplish with just the people who are in the room. It’s not going to happen. ”We still have a long way to go,” Brian wistfully confessed. Now we’re getting somewhere. I hope. Next steps will become clear shortly. As only Doug Pagitt could say, this week was an initial gathering to plan for the planning. Or something like that. It was an intentional effort, greatly appreciated by many, to not create a new network with 5-10 people in the room and then try to recruit everyone to be a part of it. It is much more tedious to have 100 people designing and building a network together but in the long run, it will have a broader base of appeal and power. I’m looking forward to where this new chapter in our conversation heads next. The view of the National Mall from the 7th floor of the Washington National Cathedral. Below is the context of an email that went out to over 1,200 clergy today, from the PICO National Network, signed by me and my friend, Rev. Rayfield Burns. I encourage you to download both the clergy guide and the congregational handout. With Congress moving full speed ahead on one of the most crucial civil rights and social justice issues of our time – making health care affordable and accessible – it is important that people of faith take the time to understand how health reform will impact the quality, stability, and affordability of health care for all Americans. PICO and Sojourners have teamed up to produce “A Guide to the Health Care Reform Debate,” an 8-page booklet aimed at helping clergy and lay leaders participate in the health care debate in a constructive way, based on their values. View the guide here. We’ve also produced a 2-page congregational handout that can be shared with members of your faith community. Click here to view the 2-page handout. Please note that these guides have been produced for Christian faith communities. Both pieces begin by examining the biblical basis for the need for quality health care. They then look at the current health care reality for many of our nation’s families, as well as the different proposals being considered in D.C. Finally, they lay out some principles for a values-based, commonsense approach to reform, as well as ideas for how people of faith can influence the debate. View the 8-page guide for clergy, or the 2-page congregational handout. Together, people of faith can have a tremendous impact on the decisions of our elected leaders in D.C. and be a decisive factor in moving our country towards ensuring quality, stable, affordable health care for all Americans.